Rocky Mountain Cross Country (RMXC) camp is set in idyllic Crested Butte, Colorado - listed by Nike as "One of the best running destinations in the country." 20 days of high elevation training and miles of Rocky Mountain trails at the back door of Team Prep USA Headquarters. ​Prices are the same as last year, but this year online processing fees are included in the ticket price. High altitude training. Life changing summer. Finely tuned Rocky Mountain running experience. Settle in with a smaller group size, explore extra trails, and acclimate to the 10,000 ft elevation before the main camp begins. All levels welcome. The true Team Prep USA experience. No lectures are repeated. Participate in the Fourth of July parade, end-of-camp dance, experience every Team Prep trail. Perfect for any experience level. Optimize your camp training with the smaller Summer Distance Project. Emphasis is set on running, sleeping, eating, and repeating, for a Rocky Mountain running experience. All levels welcome. To get the most out of your travels and camp experience, we recommend Pre-Camp to allow for altitude acclimatization, followed by the 20-night camp for a full RMXC experience. With this option, campers get to see all the lectures from coaches, Olympians, and doctors (no repeats), all the trails, the 4th of July Parade, the end-of camp party, and more! Team Prep USA camps include the highest quality dri-fit shirts unique to each camp. Student athletes can also add to their swag collection at the TPUSA Gear Store during each camp. Hats, Jackets, Compression Socks, Stickers, and more. What needs to be to Team Prep USA by June 10? - Registration, full payment, medical clearance, travel itinerary, letters of recommendation (new campers only). Log into your ACTIVE account to access your registration status. Which session is right for me? -Each session is appropriate for each age (11 - senior) and experience level. The 4, 8, and 10-night camps all take place within the Main 20-night camp dates. Pre-Camp and Summer Distance Project are 7-night and 14-night sessions that take place before and after the Main 20-night camp, respectively. These smaller, more intimate groups, are able to experience different trails and activities not possible with a larger group. Pre-camp is housed in the Western dormitories; Summer Distance Project in downtown Crested Butte. To get the most out of your travels and camp experience, we recommend the 20-night camp. What's the difference between Pre-camp and the Main 20-day camp? 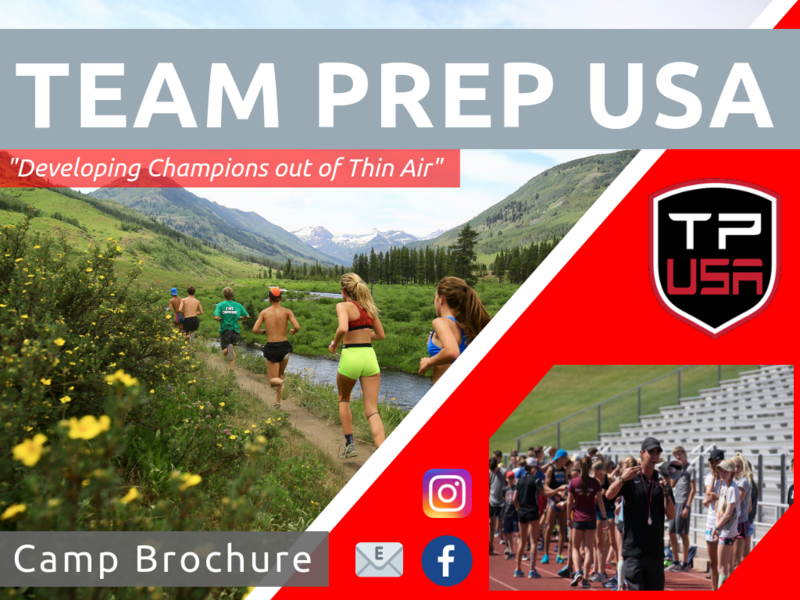 - Pre-Camp and Summer Distance Project are 7-night and 14-night sessions that take place before and after the Main 20-night camp, respectively. These smaller, more intimate groups, are able to experience different trails and activities not possible with a larger group. Pre-camp is housed in the Western dormitories (as is the 20-night camp); Summer Distance Project in downtown Crested Butte. To get the most out of your travels and camp experience, we recommend the 20-night camp. Lectures do not repeat, each day is a new experience! Are Letters of Recommendation Necessary? For first time campers, yes. Over the years Team Prep USA has developed a large following and makes it a priority to protect the campers and clients that are already involved. Airport Shuttles - Shuttles can be purchased on your ACTIVE Registration Account Page. Shuttles from Montrose Airport are $50 each way. The shuttle from Gunnison Airport and bus drop-offs is free. How much money $ should I send my camper with? All meals (breakfast, lunch, dinner), with the exception of the 4th of July dinner in Crested Butte, will be included, as well as water and Gatorade for the runs. The amount of money from that point is completely camper-dependent, based on what souvenirs they may stumble upon or snacks they purchase. Some campers do utilize the Walmart that is next to campus to buy snacks, power-bars, etc. We also have a Team Prep USA gear store with running accessories for purchase (shorts, shirts, recovery tools, hats, socks, etc.). Also be sure to bring quarters/dollars for the laundry machines! Very rough estimate: $100 cash; each place is credit-card accessible. Early Arrivals / Late Departures: If your travel options limit you to arriving before check-in day (or departing after check-out day), we recommend staying at The Holiday Inn Express, on the Western State University campus. The Holiday Inn is a short walk away from the Team Prep USA dormitories, however we will send a camp-staff to pick you up/drop you off and get checked in. Unfortunately, we cannot house campers outside of the camp session dates. Is there a mailing address for Rocky Mountain Cross Country (RMXC) Camp?